Precise and easy measuring for all color formulations! 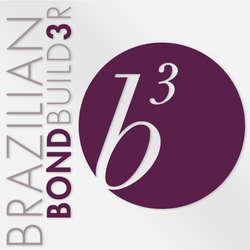 Now you can enjoy all the benefits of b3 Brazilian Bond Builder in a convenient, easy-to-use professional size. Designed with the busy colorist in mind, this bottle makes it easy to measure and mix b3 Brazilian Bond Builder into all of your color formulations and lighteners to dramatically reduce breakage and prolong color life with no added processing time. Measures 1/8 oz. (3.5mL) to 1/4 oz. (7mL) depending on color service. Remove both the outer cap and inner foil seal from your new b3 Brazilian Bond Builder Pro Size Bottle. Insert the dosage dispensing system and tighten all the way down to ensure an airtight closure. Once you have mixed your color formulation to desired consistency, gently squeeze the bottle until b3 fills to desired amount, making sure that the catch cover is loosened out of the locked position in order for liquid to flow. Remove catch cover and pour product into your color formulation and mix thoroughly. Proceed with color application. Please be sure to replace catch cover and twist into lock position when done to avoid spilling. This easy-to-use one-step system is added right to your color formulations and doesn’t add any additional processing time!